Free Booze, LR: Darragh O'Neill, Dave Farrell, Pat Dillon (back), Meridith Brosnan and John Russell. 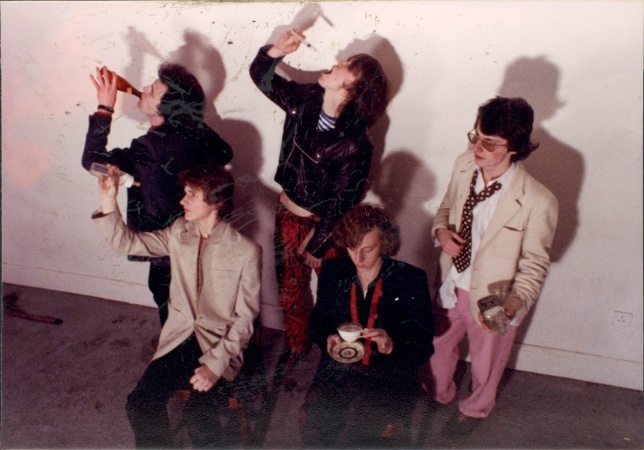 Free Booze were a punk/new wave band formed in Dublin in 1976 by some pupils at Gonzaga College in Ranelagh. The original lineup was John Russell (vocals, harmonica), Dave Farrell (lead guitar), Patrick Dillon (rhythm guitar), Meridith 'Broz' Brosnan (bass) and John Byrne (drums). 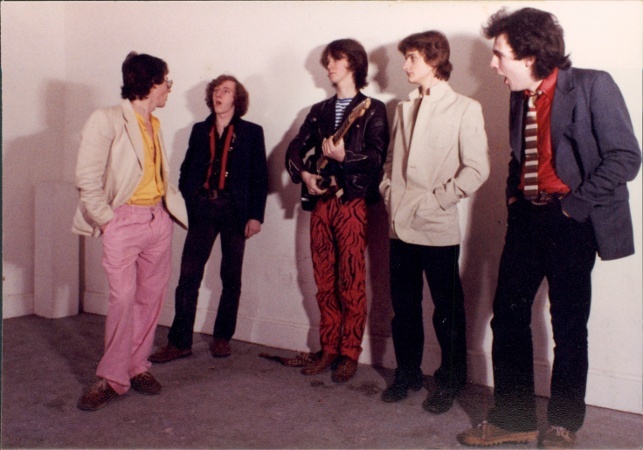 Patrick Dillon asked his ex school mate Darragh O'Neill to step in on drums for a gig in Moran's Hotel in 1978, as John Byrne was about to leave. Darragh became the permanent replacement. The band played mostly originals from the get go, plus some '50s and R&B covers. These originals were mostly written by John Russell and Meredith Brosnan, usually Russell handling the music and Brosnan the lyrics, though they also wrote the other way around and other members of the band contributed aswell. They regularly packed out McGonagles (including Saturday afternoon all ages shows) thanks to posters promising 'Free Booze'. They played the Baggot Inn, Toners and the Trinity Ball. 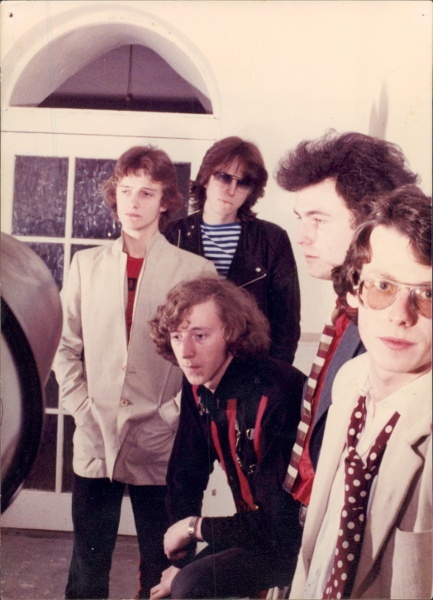 They played the Dandelion Market on two occasions, Sunday 10 June 1979 (with The Discords) and Saturday 21 July 1979. DJ Pat James was a big supporter and played their 4-song demo regularly on his show on Radio Dublin. The 4 songs were: "Voulez Vous", "Sam Sara", "Kitchenette" and "You Were There". "Voulez Vous" is a fantastic, punky garage track. If anyone has a copy of this demo, please get in touch. Another popular original was "Orange Girl". They were also interviewed on Dave Fanning's pirate radio show in his pre RTE days. They appeared on RTE TV several times including Young Line (with The Atrix), Our Times (on Monday 2nd April 1979) and Liam Nolan's Summer House. Other songs included "My Night Out" (a John Russell original) and "The Bookie", which included a drum solo when played live. Before the split, the band embarked on the Teenage Kicks Dublin tour. Dave Fanning opened their first gig at McGonagles, when they were reputedly poor, but the gigs got better as the tour progressed. They split in the early 1980s. We need your help to correct and/or complete this entry. If you can provide more information about this band, have scans, photos or any other memorabilia we can use, or spare copies of any releases, then please get in touch.